Oxford houses unique museum collections of objects closely related to gathering, producing, growing, preparing and consuming food. They are testimony to a great variety of foodcultures in the world. A cooperation between the University of Oxford Museum Collections and the Oxford Symposium on Food and Cookery (OSF) creates excellent opportunities for symposiasts to present work in a new context, as well as providing the museums a gateway into the food world and reaching new audiences. 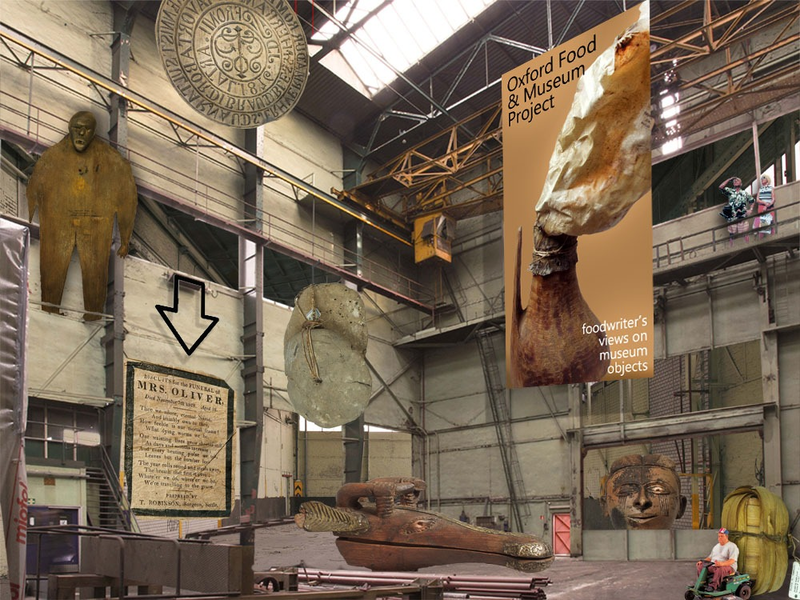 This project aims to bring together museumobjects and the skills and expertise of foodwriters. It aims to present culinary views on museumobjects in a wonderful mix of knowledges, activating collections through personal stories, poetry, imaging and recipes, in various forms: as a culinary roadmap through collections, apps, analogue and/or virtual exhibitions or through a series of small, beautifully designed books, depending on the annual topic of the symposium. The collections and displays of the University of Oxford Museums are rooted in time and place and can be read as testimonies to the ages of Englightment, Empire, Romanticism, Positivism and De-colonization, offering interesting perspectives on the OSF-theme Food & Power in 2019. We start with a pilot with the Pitt Rivers Museum. The Pitt Rivers Museum is the Anthropology and World Archaeology Museum of the University of Oxford, founded in 1884 and visited by over 430.000 visitors per year. The typologically-organised displays function as a ‘democracy of things’, encouraging cross-cultural reflection and celebrating human creativity, global interconnectedness and cultural diversity. Butter churn comprising a lamb skin with wooden funnel for filling it. Written on object - BREAD STAMP. NORTHERN ICELAND. Pres: by T.N. ANNANDALE ESQ., 1900. The shallow bowl is carved from one piece of wood. Used as war rations, etc. Two circular cakes, tied together with plant fibre. KEYWORD: Food / Specimen / CLASS: Food / Specimen / ?. Accession Book Entry - 1900. Nov. Collection of specimens obtained from the Ainu of Yezo (chiefly of Volcano Bay), by Father Rousseau of the Societe des Missions Etrangeres de Paris, Mororan. The collection was made at the request of Prof. B. H. Chamberlain. List: -- . . . bread, ‘outurep’ made from wild potato (ubairo, Jap. ), used as war rations etc. . .
Related Documents File - Letter in French from J. Rousseau dated 4/9/1900 and translation by Linda Mowat. Rousseau says that he hopes to send “a complete and enumerated list of the objects” [it is not known if the PRM has received one]. He talks of the poor conditions that the Ainu people live in and gives reasons why he believes that they will soon die out. He also makes notes on specific objects - which are added into the appropriate entries. Notes sent by Dai Williams after his visit on 8 July 2013: The PRM catalogue notes term these flat circular starch cakes as “outrep”, a word probably derived from the Ainu word turep meaning cardiocrinum lily (Cardiocrinum cordatum var. Glehni Makino). It was this lily that was traditionally the main source of starch in Hokkaido. However other smaller lilies and fritillaria were also used. Different locations offered different choices. These examples were probably collected in the Ainu fishing village of Muroran in southwestern Hokkaido where the imported and cultivated “wild potato” had perhaps replaced the lily. The general name in Hokkaido for such starch cakes was shto, sito or shito. The cardiocrinum lily grows in the shade in riparian woodlands. Depending on location Ainu women would harvest the bulbs using digging sticks at any time between May and July. The bulbs were carried back to the village, carefully washed, placed in wooden barrels and mashed. Then water was added, the barrels covered and the mash was allowed to soak. The finer starch was precipitated to the bottom of the barrel and the lees floated to the surface. They were skimmed off and set aside. The water was poured off and the fine starch collected to be used as a stomach or headache medicine. The lees, known as akam in Ainu, were wrapped in the leaves of butterbur (Petasites spp.) and left to ferment for a week or two in a well ventilated place in the shade. They were then formed into circular cakes, dried in full sun and, when fully dried, placed in the storehouse until needed. In winter they would be broken up and added to stews to thicken them. The illustrated examples, below, were made by Anetai, Masaki, a professor of botany at Hokkaido University using traditional methods. References: Kayano, Shigeru. Ainu no Mingu, page 189. Munro, Neil Gordon. Ainu Creed and Cult, Columbia University Press, New York, 1962, page 17. Fukuoka, Itoko. Ainu no Shokubutsu (Ainu Flora), Sofukan, Tokyo, 1995, pages 94 to 98. Wooden casket, overlaid with brass. Base in the shape of a cow&apos;s or antelope&apos;s head. Both of these animals are used for sacrifices to the gods. Boxes like this are for kola nuts: they are owned by chiefs and used for ceremonial presentations to the Oba. Accession Book Entry - MISS MARY H. KINGSLEY. The following specimens chiefly collected by the late Miss Kingsley in W. Africa, were bequeathed by her to her brother Charles G. Kingsley, to be transferred to the Museum at his death. Mr. Kingsley generously surrendered his life interest in the specimens and presented them at once to the Museum, September 1900: The following bronzes [sic] from Benin city, taken during the punitive expedition under Admiral Rawson, February, 1897... Carved wooden bowl with cover, in form of an animal&apos;s head (?a cow), partly overlaid with brass. Object description: Anthropomorphic jar, handmade from a well levigated clay with small to medium gold-coloured mica inclusions, slipped and burnished on the outside and fired a light pinkish brown colour (Pantone 7515C), mottled with black patches (Pantone black 7C). Some of the patches may be soot adhering to the surface, presumably from the firing process, as they are flaking off in places. Slight horizontal ridging up the lower body suggests that the vessel may have been coil built. The jar is roughly circular in plan view. The top of the vessel has been modelled in the shape of a female head, with a small oval opening in the back of the head. The back of the head is curved, with two raised sections on the top represented bunched hair; this hair is delineated by rows of impressed marks made with a tool that has a square or angular leading edge. These rows divide the hair into a number of sections, with a parting running down the centre, two angled partings on either side, and a row running around the entire edge of this raised area, then a single curving row running horizontally around the back of the head, just above the ears, and a vertical row down from the middle of this to the top of the neck. The hair itself is represented by a number of finely incised oblique and curving lines, following the shape of the head. The face is indicated using a combination of modelling, incision and impression. Modelled sections include the ears, eyes in the form of raised lentoid shaped areas with incised lines marking their inside edges, a pointed nose with deeply impressed circular nostrils at its base, slightly pouting lips with a horizontal line cutting into them to form the mouth, and a curved chin. Incised lines are used to further define the eyes, and to represent facial scarring, which consists of 3 lines meeting to form a &apos;crowsfoot&apos; shape near the outside corner of each eye, and 5 vertical lines running down the cheeks from the base of each eye. Impressed marks are used for additional details, including groups of from 2 to 3 short dashes across the brow and cheeks, probably representing further scarring, and rows of impressed square marks defining the upper curve of the brow, running vertically down the forehead, and representing the eyebrows. The head sits on a short, slightly flaring neck, with a flat raised collar around its base, marked by incised lines above and below. This collar is decorated with a row of impressed squares running along its top and bottom edges, while between them is a repeating motif made up of pairs of vertical lines framing an X-shaped motif, with the upper and lower triangualar sections of this being filled in with incised hatching. The body of the jar is piriform in shape, with a high rounded shoulder and convex sides curving into a low disc base. Flattened rectangular strips have been applied to the top of the body and as four vertical bands running down at right angles from this towards the base, with a short strip running down to a circular raised disc added to the shoulder area between, making the actual surface of the vessel appear as a series of recessed panels. The upper band has been decorated with a row of impressed circles, a thickband of incised hatching, then a more narrow row of impressed marks, possibly square, although these are rather worn. The vertical ribs are decorated with a vertical band of incised crosshatching, framed by incised lines on all sides, while the roundels are defined by 1 or 2 concentric circles around their outer edge, with a vertical strip down the centre with a row of circular impressions running down it, flanked by vertical lines and a row of impressed squares. The centre of one roundel has been left blank, perhaps inadvertently. The semicircular spaces left on either side of this strip have been filled with incised crosshatching. Each recessed panel around these roundels is decorated with a border made of rows of impressed dots next to rows of impressed squares, running around the edge of the space, with another row around the outside of the roundel. The lower body, below the roundel, is decorated with a motif consisting of a central lozenge with a triangle extending from either side, and a third triangle extending from its base point. The body of these shapes are formed from rows of impressed squares, with a central line running horizontally across the top part of the motif, and vertically down the centre of the lozenge, and the base triangle filled with a mass of impressed marks applied in a crosshatched pattern, very tightly packed. Each corner, and various junction points are also marked by an impressed circle. This motif is repeated, with minor versions, in the lower part of every panel. The underside of the base is also decorated. This consists of a series of short lines radiating out from the centre, framed by 2 concentric circles, then an outer band made from 4 concentric circles, cut by pairs of short lines framing cross motifs. The decoration has been added using at least 3 types of tool. One has a sharp point and creates incised lines. The second has a more angular leading edge and creates small square impressions. The third is slightly larger, and circular. Some of the impressions made by this last tool are crescent shaped, rather than complete circles, and others have small raised centres, suggesting that this was probably a hollow cylinder, such as a grass stem, rather than a solid ended tool. The vessel is heavy, with a weight of approximately 1275 grams, suggesting that it is rather thick walled, and it is questionable whether it was intended to function as a container. It is nearly complete, with a small area of the tip of the nose damaged, and a minor crack and small chip to the edge of the base. It has a height of 222 mm; the top of the head measures 74 mm across; the shoulder has a width of 150 mm and the base is 72 by 70 mm in diameter [RTS 15/11/2004]. Accession Book Entry [p. 248] 1934 [insert] 8 [end insert] - MAJOR P. H. G. POWELL-COTTON, Quex Park, Birchington, E. Kent. Specimens collected by himself & Mrs Cotton, during hunting trips, 1933, viz: [...] [p. 260] - From the ZANDE tribe, LIRANGO, YAMBIO, DINGBA & TAMBURA [p. 262] [insert] 134 [end insert] - Ornamental pottery jar surmounted by a well-modelled human head; very small orifice at back of head. (1086). Additional Accession Book Entry [p. 261] - 1934.8.134 no. given. NM [red biro] A24.F17.33-34. Card Catalogue Entry - There is no further information on the catalogue card [RTS 3/2/2004]. Related Documents File - Typewritten List of "Curios Presented to Dr. Balfour (sic) by Major & Mrs. Powell-Cotton. Zande Tribe". This object appears as item 1083: “POT. with head (perfect)". This entry has been added by hand to the end of this section; other Zande material was collected by Powell-Cotton between 27/4/1933 and 29/4/1933 within the modern administrative district of Western Equatoria. This object also appears on a typewritten list of Zande pottery unpacked at Quex House on 6/10/1933: "B.1086, Pot with head no supports". &apos;B&apos; stands for &apos;Balfour&apos;, indicating that the vessel had been allocated by then to the PRM [see letter dated 9/10/1996 in RDF 1996.53.1]. Also contains details of a cine film &apos;some tribes of the Southern Sudan&apos;, taken by Powell-Cotton during this 1933 expedition, copies of which are now in the National Film and Television Archive and the Powell-Cotton Museum in Kent [RTS 14/3/2005]. Old Pitt Rivers Museum label - Pot with very small aperture at top of head. ZANDE, BAHR-EL-GHAZAL, E. SUDAN. d.d. Major Powell-Cotton, 1934 (1986) [paper label stuck to side of object; RTS 17/9/2004]. Research notes: This object was obtained by Percy Horace Gordon Powell-Cotton and his wife Hannah between 27th and 29th April 1933 during a shooting expedition in the Southern Sudan; museum records do not indicate specifically where this was obtained, but they were collecting material from Li Rangu, Dinga, Yambio and the road to Tambura during this period. The most likely location is Li Rangu, where a Zande potter called Mbitim was producing vessels in this style. Powell-Cotton visited Mbitim&apos;s workshop on April 28th, collecting raw samples of clay and some of his tools (see 1934.8.132), as well as several examples of his work. This is thought to belong to that group because of its cultural provenance, and its stylistic similarity to vessels elsewhere that are known to have been made by Mbitim at that time, such as those now in the Cleveland Museum of Art (1996.301-302) and the British Museum (1934.3-8.27, a water vessel in the form of a female figure, and 1931.4-11.3, another female headed jar; see N. Barley, Smashing Pots, fig. on p. 145 and J.C.H. King (ed. ), 2000, Human image). These seem to be identical in style to our example - particularly with decorative details such as the raised strips and roundels, the impressed designs and shape of the facial features. For similar Zande bowls in the Pitt Rivers collection, see 1930.86.42-44, 1931.66.2-3; for anthropomorphic jars, see 1950.12.117-118 (larger than this example, and said to be water vessels); for bookends in the same style, see 1934.8.135 and 1996.53.1. In the 1930&apos;s when Powell-Cotton visited it, Li Rangu was a centre of foreign contact for the district (N. Barley, 1994, Smashing Pots, p. 144). The mica inclusions noted in the clay of this example seem to be a characteristic of Zande pottery; mica occurs naturally in beds throughout the region, known as hilidiwe, meaning &apos;slough of the moon&apos; (P.M. Larken, 1926, "An Account of the Zande", Sudan Notes and Records IX no. 1, p. 4). Schweinfurth noted the presence of mica in both Bongo and Zande pottery, which he suggested made their wares very brittle. He believed this mix to be naturally occurring and that potters did not know how to remove it from their fabrics: "... [Zande potters] have no idea of the method of giving their clay a proper consistency by washing out the particles of mica and by adding a small quantity of sand" (G. Schweinfurth, 1873, In the Heart of Africa Volume I, p. 292; Volume II, p. 25). This mica may well have been left in the clay deliberately, as it gives the vessels an attractive sparkle, and does not seem to have impaired the plasticity of the material, as the detailed modelling of several of these vessels demonstrates. Larken discusses Zande customs regarding the collection and working of clay. Clay is usually found on the banks of a stream, and prepared by pounding it in a mortar before shaping it by hand. Tools are limited to pieces of gourd or a rounded pebble for smoothing; decoration is applied by something simple, such as a short stick bound with cord. He describes two kinds of vessels that are made, one with a low collar around the mouth, and another with a bow-shaped neck (see 1931.66.2-3). The smaller pots are said to be used for cooking meat, the larger ones for water or making bakinde; other pots are for brewing beer, while long-necked varieties are used for washing the face and hands - this last type may have a head adorning the neck. The Pitt Rivers Museum example would seem to be of this last type. Each type has its own Zande name. Decoration often covers the whole surface. Larken goes on to describe the firing and finishing: "When dry, pots are turned upside down and baked in the open, only certain kinds of wood being suitable for the fire. While still red-hot, they are splashed with water in which bark of the ndili tree has been soaked, in order to blacken them. A black polish is sometimes given to the smooth surfaces, by means of graphite grains, which are mixed with water and a little powdered ironstone, painted on the clay and gently but continually rubbed into it with a polishing-pebble before the pot is fired". The resulting vessel is not very strong, and only slightly porous, if at all; broad leaves may be used for a lid, if required (P.M. Larken, 1927, "Impressions of the Azande", Sudan Notes and Records X, pp 129-131). According to Evans-Pritchard, all Zande potters were male (Evans-Pritchard 1971, The Azande, p. 95). According to Larken, Zande men and women both practiced cicatrisation, but &apos;the face is usually not touched, except where an individual has come into contact with Arabs and copied their habit in this direction (P.M. Larken, 1926, "An Account of the Zande", Sudan Notes and Records IX no. 1, p. 31)&apos;. This practice may have become more widespread since Larken&apos;s time, however, as most of the modelled human figures made by Mbitim (1996.53.1, 1934.8.133-135, 1950.12.117, 1928.67.4), or Zande woodcarvers (1928.67.4, 1932.30.14-15) are depicted with this kind of facial scarring [RTS 24/8/2005]. Other information: Powell-Cotton usually wrote his own collection numbers on his objects in pencil; his number has not yet been located on this particular object. Pudding made from coconut milk wrapped in palm leaves. KEYWORD: Food / CLASS: Food / ?. Accession Book Entry - PROF. W. SOLLAS, F.R.S. University Museum, Oxford. Oct. - Collection of objects made [insert] by him [end insert] during the coral-boring exped. to Funafuti, Ellice Islands, S.Pacific. 1896 riz: - native pudding made from coconut milk, ib. [see (1906.58.35): Funafuti]. Additional Accession Book Entry - 1906.58.54 number given - LW W. around the package [circumference] = ca. 26 cm. How feeble is our mortal frame! What dying worms we be. Leaves but the number less. Whate&apos;er we do, where&apos;er we be. We&apos;re travelling to the grave. PREPARED BY T. ROBINSON, Surgeon, Settle. Paper wrapper used to contain biscuits distributed as part of a funeral ceremony. Additional Accession Book Entry - [on facing page] &apos;v[ide]. Gentleman’s Magazine, 1802; Rev. Canon Alkinson [sic; Atkinson] "40 years in a Moorland Parish", p227; Hartland “Folklore”, XXVIII, 1917, p.303 [sic; see reference below].